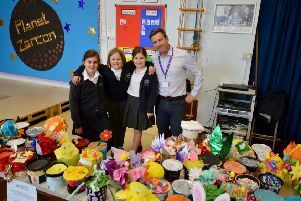 Pupils from Harrogate’s Ashville Junior School are helping to take part in a nationwide scientific experiment that is simply out of this world! The youngsters are participating in the Rocket Science Project – a partnership between The RHS Gardening School and the UK Space Agency – which will contribute to knowledge about growing plants in space. Last September, 2kg of salad seeds were launched into space where they were held for six months in microgravity. The seeds have now been returned to Earth and, together with “control” seeds, distributed to schools throughout the country where they are now being grown and their progress monitored and recorded. Heading up the Ashville experiment are Junior School teacher Debbie Baker and Senior School Head of Physics, Conor Davies – who is one of 25 lead educators working for the National Space Academy delivering science, maths and astronomy masterclasses to pupils and teachers across the UK. Now in the third week of the experiment, the Ashville Eco Warriors and the Greenfingers Club – who don’t know which seeds have been to space and which have not - are collecting data on the plants’ progress, such as germination, growth, leaf count and plant height. Once the 35 day experiment has concluded, the results will be analysed to discover whether space travel has impacted on the growth of the seeds. Mr Davies said: “We are delighted to be part of this national experiment which is providing the children with the opportunity to be part of a scientific project that is not only exciting, but out of this world. “Thanks to this, the pupils taking part are learning about space science at the same time as biology and physics. British ESA astronaut Tim Peake said: “It’s a huge privilege to be the first British ESA astronaut flying to the International Space Station. During my six-month tour, I’ll be conducting a number of experiments on the International Space Station.